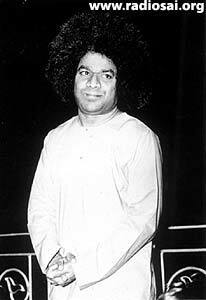 This is the second part of a Radio Sai interview, recorded in May 2003, with Prof. Jayalakshmi Gopinath, the Warden and Head of the Department of English, Sri Sathya Sai University, Anantapur Campus [To read the first part again, click here]. 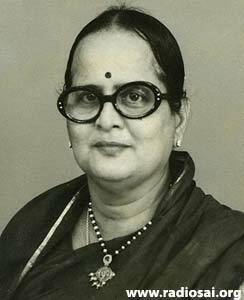 Prof. Gopinath’s association with Bhagavan goes back to as early as 1948 when she was a little girl! An epitome of dedication, service and love at His Lotus Feet for more than half a century, in this interview, Jayamma (this is how Bhagavan calls her) shares some of her cherished memories and fascinating experiences with Dr. Rajeshwari Patel, an alumna and currently faculty member of Sri Sathya Sai University, Anantapur Campus. Dr. Rajeshwari Patel (RP): Madam, did Swami ever reveal to you during this interview or at any other time, that He is an Incarnation of Shirdi Baba? Jayamma: I could take this back to about 1954. In the New Mandir, Baba then was not giving public speeches. He would call people in small circles and just give them the special jewels of spiritual truths. And I would be one amongst them in that crowd. “I am the Vedas!” That was a resonant echo throughout the walls of Prashanthi Nilayam. There was one Brahmin elderly lady whose husband was a famous scientist. She started believing in Baba so much and we could see that transparent love she had for Swami. They came to Puttaparthi and at that time there were no rooms in the New Mandir also. Devotees had to get bamboo thattis, that is, bamboo strands made into a sort of slim wall, which could be used to make temporary shelters. Many people would help making this. That is how we used to construct places to stay in those days. There was nothing whatsoever, except the plain Mandir. The Brahmin lady was very orthodox. And people were making fun of her. But she loved Swami a lot. She used to cook everyday and would be very fond of giving whatever she cooked to Swami. And she would do this observing Madi Acharam, that is, strict rituals. Swami resided on the right side of the Mandir. Only some people who were given permission could take the food up and His sisters would serve Him. After the lady cooked the food, she would walk up the steps and place it for His sisters to serve it to Him. Swami played with her. He endearingly would come near her. He would put out His feet and say “Chesko” (offer salutations). 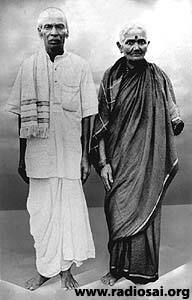 She would say, “Ledhu Swami (no Swami).” She wouldn’t touch Swami’s Feet because of the Madi Acharam. Swami would laugh and indulge her! People thought: “How silly she is! Imagine not touching Swami's Feet? Could there be greater blasphemy?” She never bothered. She just observed her rituals most sincerely. In the morning we had bhajans those days. Some of us would sit in the front and to my utter discomfiture, sometimes, Swami would make me sing. One day, this incident happened. It was Ekadashi. The Brahmin lady would fast the whole day and not take a drop of water. Observing “Madi” (ritualistic procedure), she sat apart. Swami came and saw this lady sitting at a distance from others. He told the devotees, “Make place for her!” Though people were, sort of, mocking at her and belittling her as being extremely foolish, this is what Swami did! He is Sathya, Dharma, Shanthi, Prema! He is an Embodiment of all these. How true He is! He told them, “Make way for her.” He asked her to come forward and sit near His Throne on the ladies side. That was the first time He was speaking to a large crowd. The table was brought and a mike was kept. He thumped the table, “I am the Vedas!” That was a resonant echo throughout the walls of Prashanthi Nilayam. “I am the Scriptures. I am God. Take this opportunity. If you can understand what I am, well make best your chances here. Do not carp, criticize and lose this opportunity.” He said it in such a solemn Voice. Of course, we knew it within ourselves. But Baba had not declared it in public till that day. I can’t forget it even today. “I am God Himself” that was another declaration! RP: It was not at all a common feature at that time. Jayamma: No, this was the first time He was speaking to a large crowd and He made the thumping declaration. If you and I stand on a platform, and say “I am the scriptures, I am the Vedas”, we will be pelted with stones. We were all dumbfounded and spellbound. We sat there looking at Him, not with full understanding of what He was, but absolutely stupefied of the tremendous Divinity that was there in front of us. We couldn’t believe it! RP: Did He reveal to you all about the future of what you are witnessing unfolding before you? I have heard that Swami used to tell the old devotees about events that are actually happening today. Jayamma: Yes, He has told us, sometimes, jocularly; sometimes seriously. RP: What are some of your memories of Mother Easwaramma and her relationship with her Divine Son? Jayamma: I had a very close relationship with her; I am fortunate for the bond that I had with her. I consider it a Divine Blessing. 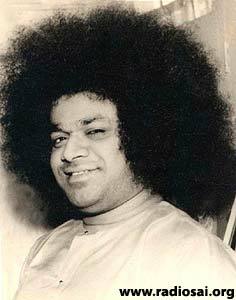 Swami had given her a room in Prashanthi Nilayam and she was the only one, not even His Father, who could just walk up to Swami’s room at any time. He would indulge her; it was so wonderful to see it. Swami was always very troublesome as regards eating. He was such a poor eater. So, sometimes the sisters, whenever Swami would let them, would cook and bring it from the village. Swami would simply dodge them. He would not eat the food that was served! He would not come and sit at the plate. And even if He came and sat for a few seconds, He would eat so little, push this aside and that to another side, and sometimes, when the sisters got tired of coaxing Him, they would bring His Mother. The Mother would say, “Swami, Thinnu Swami. Enthuku Swami neevu thinnavu?” She would cajole Him so sweetly for not eating, with all her Motherly Love and then He would eat a little. Swami would go on indulging her. He would get lovely sarees and then all of them would be spread in the room. He would invite her and say “Ra, emi kavali theesko (Come, take whatever you want).” She could take whatever she liked. He would get her some jewels also. He would do everything to make her very happy. In my opinion, Divinity was indebted to the Mother for giving Him this Divine Body. He has said, “My Life is My Message”. Maybe, He was teaching us to revere our mothers in the same way. Jayamma: He revered His Father also. The Father was a wonderful person, and I knew him. And of course, he could speak Telugu, but no other language. He had a provisions shop and he would diligently supply to the devotees the coconut and other puja items. Though my father didn’t know much of Telugu, he took to him very much; somehow they used to communicate. When we touched his feet, with such humility he would say, “Why do you touch my feet?” “You are the Father of the Avatar,” we would reply. Then he used to say, “I do not know. He is great. He is for everybody. He is no more my son.” This is the way he would speak, like a very simple person. RP: You must have been present during the anointing ceremony. Can you share with us the experience? 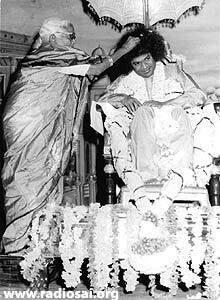 Jayamma: Yes, I have had a chance to celebrate Bhagavan on His Birthdays by anointing Him. In the past, on the birthday, we used to gather in the Old Mandir. It was a tradition where some elderly sumangali devotees (married couples) would come with plates of kumkum (vermillion), haldi (turmeric), flowers, fruits and clothes for the parents and go with a silver container which we call in Kannada Chombu. The Mother would draw the water from the well and arrange the Poorna Kumbha (sacred coconut on a sacred vessel filled with water). In the procession, after the Mother and the Father, the elder brother and his wife would follow, and then would be the two sisters. After that came Janakiramaiah (Swami’s younger brother) who was still a young bachelor. This was the hierarchical procession. They would have to be brought by the devotees with reverence along with the village band and the nadaswaram (music). They would be ushered in to the auditorium. First, of course, would be the Nadaswaram and the band, followed by the lady devotees carrying plates of all sacred things and holy items. Behind them, Swami’s Family would come and He would be sitting on the dais. And at that time all of us could garland Him. All the devotees would be waiting with garlands in their hands. First the Mother would get onto the steps of the dais, along with the Father. There would be one elderly sumangali (married lady), holding a silver vessel of oil which had been boiled with various types of perfumed herbs. It was a sight to see! Swami would bend down His head from the throne. First the Mother would take a flower, dip it in the oil and thrice she would place it on His head. Some devotees also could go and do this. My parents were called to do so as well. I had a longing to do it, but I didn’t have the courage. But He called me “Ra (come)” and gave me a chance to anoint Him. And the devotees one by one would go and garland Him, and each time He would remove the garland and throw it to the side. RP: I know from my contacts with you that you have a very fine sense of humour. Could you tell us some amusing incidents from your interactions with Bhagavan, His love for humour ? Jayamma: My father had a wonderful sense of humour, which we inherited. Bhagavan has a very fine and tremendous sense of humour. Let me share with you an amusing incident! This is something that happened at home. 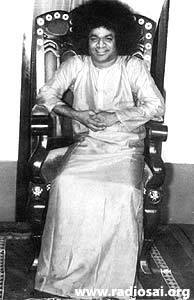 In those days, in the early 1950s, Swami would come and stay with us when He came to Bangalore. We had a cook, a lady who was very good. She would cook the food with some help from mother. Swami used to eat it with so much of love, whether He liked it or not, we do not know. She was a Brahmin virgin widow. She came to us when she was 60 years old. Her situation was none too pleasant. Her hair was shaven off and she had to wear a red nine yards saree without a blouse. This was the custom and it was belittling to her. As soon as she saw Swami, all the privations she had suffered in her life – humiliation and frustration - just melted and she sobbed. Swami consoled her. When He came, He would go to her and would talk to her. And she would, sort of, have these dry sobs. He said, “Emi Neelu Leni tankilo? (What happened? Is there no water in the tank? )”, because she had dry sobs. Everyone laughed! RP: Coming from a traditional background, did you have challenges when your family came to accept Swami. How did you overcome them? Jayamma: As a child, being brought up by parents who are pious and religious, we listened to many stories of the Gods. Our own mutt Guru, would come for Bhiksha (alms), we would host them and they would do the puja, in a lovely aesthetic way, though ritualistic. From childhood to adolescence, this had seeped into me. Mother would get up early, light the lamp, make the puja ready for father who would do all that was required. My father had a mind and a heart of gold. I remember him with so much love and gratitude. It was firmly registered in our minds, that God is a Supreme One. Everything goes on according to His Will. When we came to Sai Baba, there were very die-hard opinions which got challenged from within our family. The question came from my uncles. “Can a Brahmin go to somebody who is of a different caste and where such Brahminic rituals and rites are not performed? How can they go and worship Him?” My father had eight brothers. Ours was not very rigid, but it was a truly brahminical house. So that was the question asked of my father. And father of course, did not bother about it. Once, our mutt jeer (head of the mutt) sent word through the diwans (emissaries) to see if the house is comfortable. Typically they come with a lot of entourage (many disciples). The house should have everything, including a well. At that time, in our sitting room, we had a big photo of Bhagavan Baba. The diwan came, and he saw this large photograph of Bhagavan in the hall. In the hall they needed the place to keep a huge golden Mandir like object which had wonderful decoration. The hall was needed for the hosting. “Rayare, Swamigalu barthare, idhanu thegithubedi” meaning, “Swamiji is coming, remove it.” Father said, “Nimigi yaku yathu. Aa tharuvalla nimma nanne kelubarudhu – Nodu kollu (Don’t ask me these unnecessary questions).” He returned quietly. The Swamiji came. He had to perforce keep the photo right under Bhagavan’s picture and made a lovely puja with much devotion and in the Madhwa way where they keep a Jhoola (swing) for God. Then they sing these songs, which are very enchanting. They tie the bells around their legs for boy disciples and keep the thal in their hands, they jump in ecstasy and sing. It is a very wonderful sight. After a number of days, before he was about to leave, he called my father closer to have a personal word with him. I was there then, my mother was busy elsewhere. As soon as father went near him, he continued, ”You are the son of Bedi Srinivasa Rao, a staunch Brahmin of the Madhwa cult. How is it you are going to a Dhaithya?” (Dhaithya meant a demonic individual). “You are talking too much,” the Swamiji said. Swamiji was floored. To all of us, Bhagavan was God Incarnate. I am proud that I am the daughter of such a father! RP: One last question. What is your message to newcomers of the Sai Fold? Jayamma: Have faith, unswerving faith! Stop the vagaries of the mind which goes into unnecessary analysis because our minds are very limited. Stop the mind from unnecessary reasoning. Have faith; believe, accept and you shall see from day to day what bliss and happiness we derive, and how our character develops, where-in nothing bad can ever affect us. We can just crossover on to the shore of Divine Bliss. RP: Madam, thank you very much for sharing your very rich experiences with Bhagavan. It was a privilege having you here. Jayamma: Thank you Rajeshwari, Sai Ram.